2/32: Mammoth Lakes Condo Rental Sunrise 1 - Living Room from the Entrance. Welcome to Sunrise #1! Enjoy fantastic views of the Sherwin Mountains from this nicely updated and very well stocked condo. Recently renovated kitchen, bathrooms, and new furnishings. This is a 2 story, 1 bed + loft corner unit with plenty of natural light and vaulted ceilings. The living space has a comfy sectional sofa, recliner, dining room table that seats 6. LG Smart 55” TV (complimentary internet and cable TV provided) with DVD / Blu-ray player. Firewood is provided for the woodstove fireplace. The newly renovated kitchen has granite countertops, tile flooring, and slate appliances. It is fully stocked with new utensils, dishware, pots and pans, and many other extras. Enjoy waking up to a fantastic view of the Sherwin Mountains from the master bedroom. The master has a Cal King bed with new mattress, flat screen TV, DVD / Blu-ray player with smart capacities and remodeled closet. The downstairs bathroom has been remodeled with all new walk in tile shower, vanity with quartz counter top, and tile floor. The upstairs loft opens to the living room by a half wall. There is a queen bed and bunk bed with a full on the bottom and twin on the top. The upstairs bath has also been remodeled. There is a nice view of Mammoth Mountain when standing outside on the front entry, Eagle Lodge is less than 2 miles away and the free Red Line and Town shuttles are an easy walking distance. 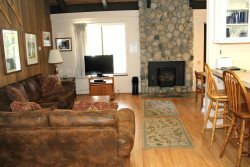 Sunrise is located on the quiet side of town near Mammoth Creek and walking distance to the town amenities such as the new town park, meadow area, groceries and restaurants. There are two outside parking spaces available. Sunrise Condominiums offer a Spa, Sauna, and Seasonal Swimming Pool. Coin-operated laundry facilities located in the common area near the office. No refunds will be given for connectivity problems or internet failures. TOT LICENSE 807-SR01. Great location and accommodations! Feels like home:) My family really enjoyed our trip, just 2 miles from Eagle lodge, you can drive or bus. We loved it and hope to come back again! Thank you for making it feel like home for us too! Thank you! The place was great. Clean home, centrally located - very comfortable, would stay here again! The place was so nice! I was very happy with my stay and will definitely be returning! Thank you for a great stay! Clean, updated condo that shows pride of ownership. Enjoyed staying at a place that has a completely renovated kitchen with plenty of pots, pans, dishes and utensils to make any meal imaginable.